ReSource Vitrine captures the essence of our current research in architecture by illustrating a prototypical community, a ‘Farming Factory’, which forms part of a network of urban infrastructures integrating both local and global communities together to test our model for creating a socially sustainability environment. 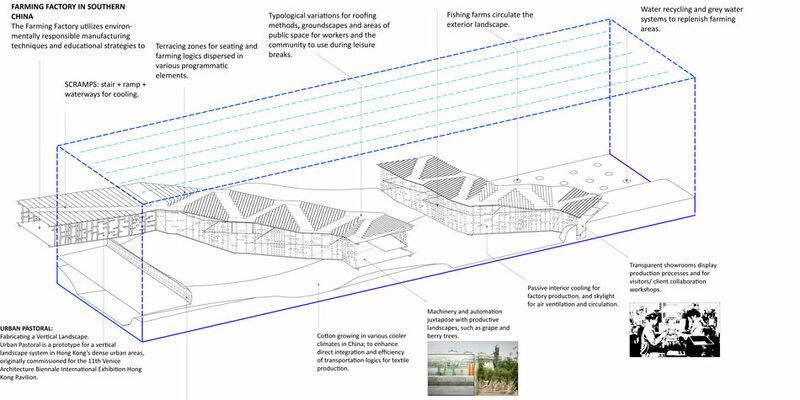 We use this approach to extend the landscape, to review the line between public and private, between the landscape and built form, farming and factory production, vineyard and art, showrooms and sustainable recycling systems. Roadside noise barriers of vegetative growth connect regional cities to megacities; all the while socio-economic forces at play compel us to address issues related to the globality of a local factory that has a residual impact on how wisely our resources are spent from Southern China all the way to New York City. We learn from visiting factories located in the Greater Pearl River Delta of China. One factory has two hundred and fifty thousand workers that produce paper products for the rest of the world. Interspersed within the compound and in neighboring fields lies farmland cultivating fresh vegetables for consumption by the workers. Opposed to dormitories for the single migrant worker found within the typical factory, here employees are encouraged to bring their entire family. In addition to other community facilities, schools provide education for the workers children, libraries encourage further education, and informal learning centers continue; sports grounds and karaoke stations attempt to provide a balanced life within. This factory reveals another side of the reality of the cultural, social, and economic progress that can be found throughout China today, where some factory complexes serve as contemporary villages. 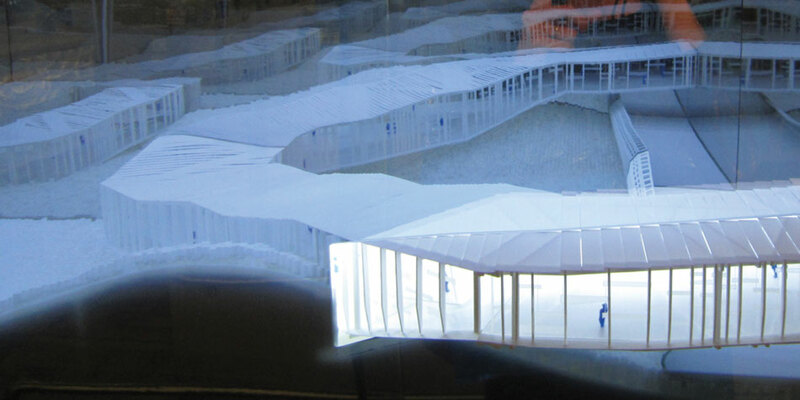 ReSource Vitrine thus asks can farming factories such as these perform as ‘positive’ social registers and models of potential for the next China? We combine, integrate ongoing projects and projective visions in this installation with past and ongoing research of ‘Linear Landscapes’, ‘Urban Pastoral’, ‘Heirloom’, ‘Chinatown WORK’, and ‘Farming Factory in Southern China’ as an interactive visual play of a model world for the Architectural League Prize 2010 exhibition. Images from the Gallery show the installation during different times of the day and interaction and reflection with and of viewers. 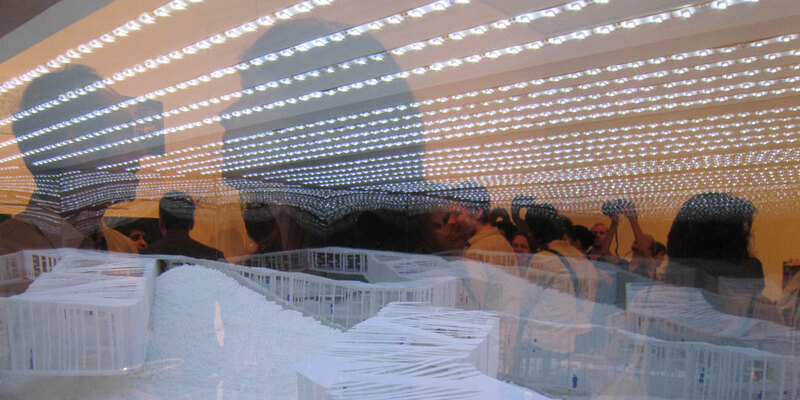 Installation images at night reveal the interior of the Vitrine- where the strips of Light reflect infinitively into the landscape – presenting similar cycles to Southern China spaces of production and consumption. The milled and hand crafted installation integrates- the research and design projects: ‘Farming Factory’; ‘Urban Pastoral’ and ‘Noise Barrier’ into this site specific installation as a model community of Social Sustainability ideals. 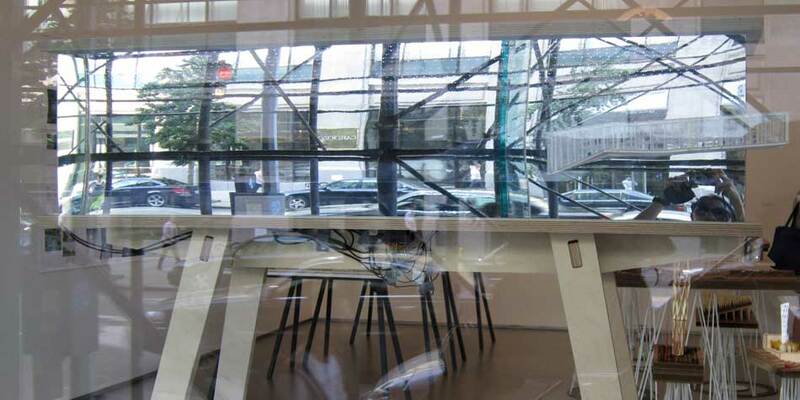 During the day the Vitrine dissolves and reflects the surroundings of New York City. The Vitrine’s transparency is intensified by the presence of the viewer’s proximity to the installation, where the viewer controls and partakes in the performance and production of information both conceptually and visually. 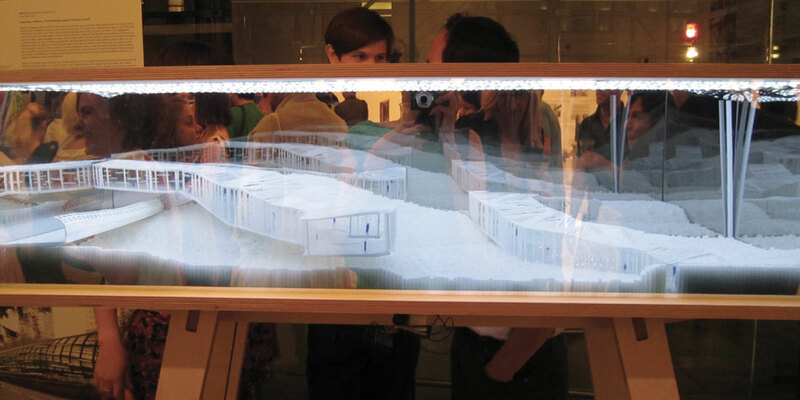 A two-way mirror is employed with specific attention to site placement, dimensions and testing of various material technologies to affectively extend and repeat the architecture’s modulation as a potentially repetitive yet differentiated urban strategy. Installation coordination: Arik Wilson, Fanny Sze, Bill Chan, Kevin Wei. ESKYIU would like to thank and acknowledge the Architectural League for support of this installation, in particular Anne Rieselbach and Nick Anderson; and the wonderful Esquel group for much support in our work. 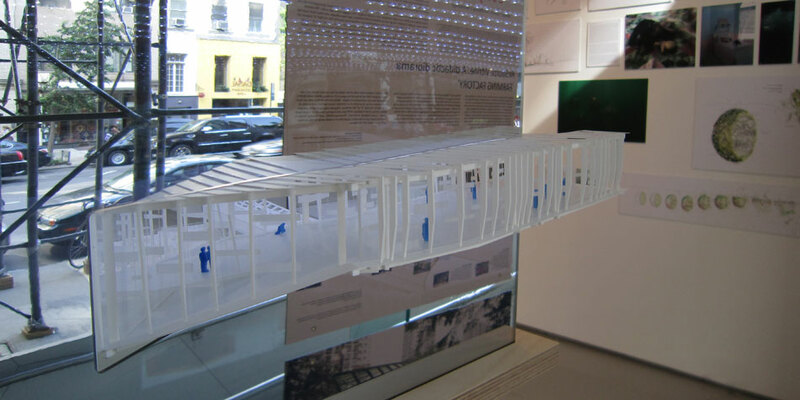 “ESKYIU’s “ReSource Vitrine”, a didactic diorama,” consolidates the elements of a number of their urban infrastructure projects which integrate horticulture and recycled materials- from a vertical landscape to an urban noise barrier- to create a scheme for a socially and environmentally sustainable community. Their intricate models situates CNC-milled structures in a field of hand-cut tubes packed together to form an abstract landscape. The transparency of the vitrines two-way mirrored case is modulated through sensor-controlled lighting whose intensity varies in response to the presence of the viewer, alternately concealing and revealing the model”. The gallery is open daily from 12:00 p.m. to 6:00 p.m. and late Thursday evenings until 8:00 p.m. Admission is free. The exhibition will also be open on the evenings of the lectures. The League thanks the Sheila C. Johnson Design Center at Parsons The New School for Design for co-sponsoring the exhibition and lecture series. The Architectural League Prize is made possible, in part, by public funds from the National Endowment for the Arts. The program is also supported by the LEF Foundation, and by Dornbracht, Ibex Construction, Susan Grant Lewin Associates, and Tischler und Sohn. Architectural League programs are also supported, in part, by public funds from the National Endowment for the Arts, the American Recovery and Reinvestment Act, and the New York State Council on the Arts, a State Agency. The Architectural League Prize for Young Architects and Designers is an annual juried competition and series of lectures and exhibitions organized by the Architectural League and its Committee. The Prize was established to recognize specific works of high quality and to encourage exchange. Winners’ designs are also on display on the Architectural League’s website and illustrated in a catalogue published by Princeton Architectural Press. The Architectural League Prize is made possible, in part, by public funds from the National Endowment for the Arts. The program is also supported by the LEF Foundation, and by Dornbracht, Ibex Construction, Susan Grant Lewin Associates, and Tischler und Sohn. communities together to test our model for creating a socially sustainability environment. the way to New York City. karaoke stations attempt to provide a balanced life within. into this site specific installation as a model community of Social Sustainability ideals. 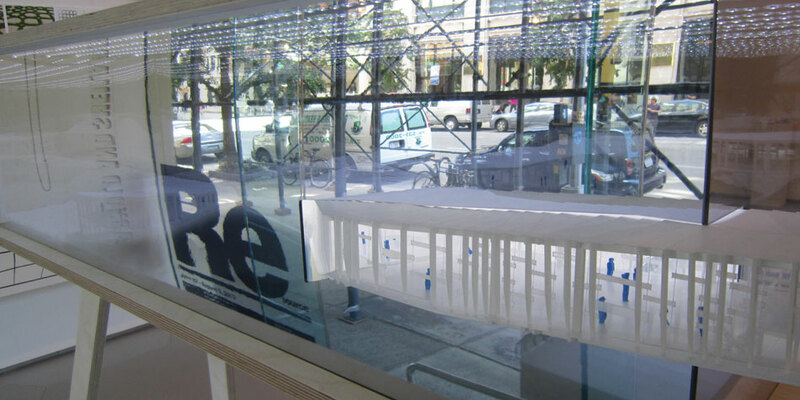 During the day the Vitrine dissolves and reflects the surroundings of New York City. Installation coordination: Arik Wilson, Fanny Sze, Bill Chan, Kevin Wei.ESKYIU would like to thank and acknowledge the Architectural League for support of thisinstallation, in particular Anne Rieselbach and Nick Anderson; and the wonderful Esquelgroup for much support in our work. 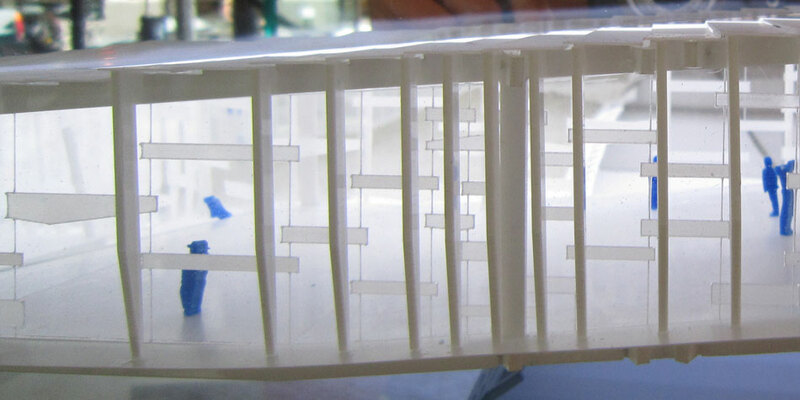 http://archleague.orgESKYIU’s “ReSource Vitrine”, a didactic diorama,” consolidates the elements of a number oftheir urban infrastructure projects which integrate horticulture and recycled materials-from a vertical landscape to an urban noise barrier- to create a scheme for a socially andenvironmentally sustainable community. Their intricate models situates CNC-milledstructures in a field of hand-cut tubes packed together to form an abstract landscape. 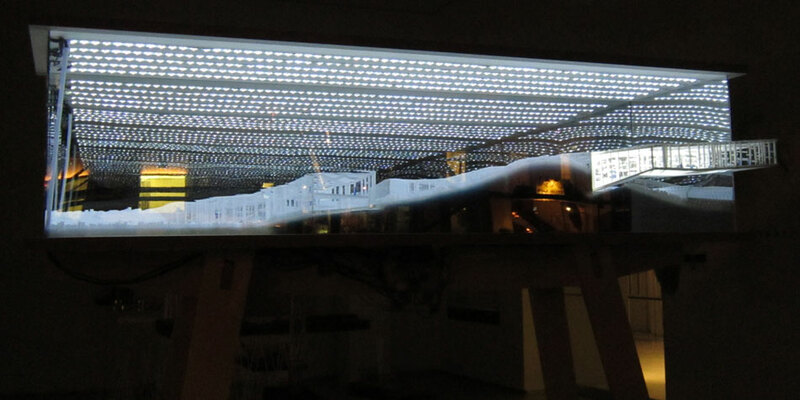 Thetransparency of the vitrines two-way mirrored case is modulated through sensor-controlledlighting whose intensity varies in response to the presence of the viewer, alternatelyconcealing and revealing the model. Arnold and Sheila Aronson Galleries, Sheila C. Johnson Design Center, Parsons The NewSchool for Design, 66 Fifth Avenue, New York CityThe gallery is open daily from 12:00 p.m. to 6:00 p.m. and late Thursday evenings until8:00 p.m. Admission is free. The exhibition will also be open on the evenings of thelectures.The League thanks the Sheila C. Johnson Design Center at Parsons The New School for Designfor co-sponsoring the exhibition and lecture series. The Architectural League Prize ismade possible, in part, by public funds from the National Endowment for the Arts. Theprogram is also supported by the LEF Foundation, and by Dornbracht, Ibex Construction,Susan Grant Lewin Associates, and Tischler und Sohn.